Air Peace has announced plans to commence flight services from Lagos and Abuja to Roberts International Airport, Monrovia and from Abuja to Kotoka International Airport, Accra on August 6. The development is coming days after the airline secured the renewal of its International Air Transport Association Operation Safety Audit certificate. According to a statement by the airline’s Corporate Communications Manager, Mr Chris Iwarah, the new routes are part of the third phase of the carrier’s network expansion project on the West Coast of Africa. “Air Peace launched its first regional flight out of Lagos to Accra on February 16, 2017. 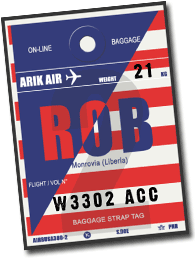 About a year later on February 19, 2018, the airline added Freetown, Sierra Leone; Banjul, The Gambia and Dakar, Senegal to its route map,” he said. Iwarah said the new routes would connect Accra and Monrovia, adding that Air Peace had added many domestic routes such as Makurdi, Warri, Port Harcourt NAF Base and Kaduna, which would soon join its network under its no-city-left-behind project. He stated that the airline had also concluded plans to reopen its Asaba and Sokoto operations. Iwarah said, “We are pleased to announce that Monrovia, Liberia and Abuja-Accra will be joining our route network on Monday, August 6, 2018. We will also be inaugurating our Abuja-Accra service, besides connecting Accra and Monrovia on the same date. This is our way of expressing our sincere gratitude to members of the flying public who have continued to support and endorse the Air Peace brand.